Day and night, the Bertrand Chaffee Hospital Emergency Department is prepared to receive patients presenting with serious injury or illness. 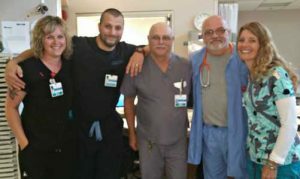 Our Emergency Department is the closest emergency medical facility for thousands of people for towns in southern Erie, northern Cattaraugus and Wyoming Counties. We see thousands of adult, pediatric and geriatric patients each year. A short “department spotlight” about emergency care was published in 2017. Our decades-long relationship with Mercy Flight of Western New York includes a helicopter landing pad for air medical transport, and a helicopter hangar that also serves as a base for the Mercy EMS ground medical transport ambulances.